Anti climbing paint or anti vandal paint is also called anti burglar paint, anti intruder paint, non drying paint, no climb paint and security paint. The various names used to describe this valuable material reflect the multitude of security applications for which it is effectively used. What is Anti Vandal Paint? Anti vandalism paint, or anti climb paint, is a non-drying, petroleum gel based paint which is applied thickly to surfaces which might otherwise be used by vandals, thieves and intruders. The paint does not set, remaining in gel form and therefore very slippery. Attempts to climb any surface to which it has been applied are almost impossible as vandals and intruders simply can’t get a grip with their hands or feet and the paint will contaminate their skin and clothes. The fact that this security paint is non-drying is what makes it a highly effective anti climb trespass and intruder barrier. Anti climb security paint is widely used to prevent unwelcome people from gaining access to rooftops and property. Vandals will often climb structures to gain access to areas where they can apply their tags and spray-paint artwork. Anti-vandal paint will stop them. On poles and posts supporting CCTV equipment. Preventing theft and vandalism. On lighting support posts to prevent theft and damage. Schools where it is used to prevent access to rooftops and protect pupils from potential climbing injury. Churches, where anti climb paint is now extensively used to prevent the theft of lead. This has become a requirement of most ecclesiastical insurance policies. Ministry of Defence property where high levels of security are required. Supermarket goods yards and industrial sites which need protection from burglars. Homes and property, to deter would-be intruders from attempting to scale perimeter walls. On scaffolding to prevent people from climbing and potentially injuring themselves. As security paint for drainpipes which would otherwise provide a possible route for intruders to gain access to rooftops or windows. As noted, anti climb paint is now recommended by the London Diocesan Advisory Committee as a practical method for deterring theft of valuable lead or copper from church rooftops and theft of pipe-work. Insurance companies require that such buildings pay rigorous attention to security in order to deter and prevent what has become an escalating area of crime. An important point to keep in mind when considering security paint is that it is completely non-toxic and non-corrosive making it safe to apply to wood, metal, plastic, brick, concrete, fibreglass, root tiles, slate and stone. It not only helps prevent climbing, it also helps protect surfaces against weathering. There are many different types of anti-climb paint on the market today so how do you know that the paint you are buying is effective and the best available? The security paint provided by Insight Security has been manufactured specifically for us. It contains no hazardous ingredients, is very easy to apply and is widely used as an effective security barrier. Available in cans of 1.0 litre, 2.5 litres and 5.0 litres and various colours, it takes around 2.5 litres of paint, applied at the recommended thickness, to cover around 1 square metre. Whether it’s your home, your office, a place of work or a commercial establishment, the property owner has a duty of care, under the Occupiers Liability Act 1984, to anyone who is on their property. This duty of care applies to everyone, including unwelcome intruders, burglars and vandals. This means that if someone was to slip and injure themselves as a result of your security paint then this is considered a foreseen hazard for which warnings should have been provided. Another important consideration is that if the wall or surface which has been painted with security paint adjoins a public highway then the Highways act 1980 applies, which states that care must be taken to avoid harm or injury. Another consideration to keep in mind when planning the use of anti climb paint is that it is messy and will potentially stain or mark the clothing of anyone coming into contact with it. It is therefore generally recommended that security paint is never used on surfaces in areas where people regularly and legitimately come into contact. It is also recommended that anti-climb paint is only applied to surfaces which are above 2.1m (7 feet) from the ground. This is recognised as high enough to avoid inadvertent contact. 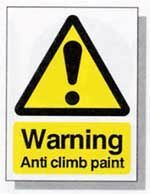 As noted, if you aim to use anti climb paint you must discharge your duty of care to everyone including trespassers and would-be burglars. In practice this means presenting warning signs telling people that anti climb paint is in use. Your signage should be located in the area where the paint has been applied and located prominently so that people are adequately warned. If you are applying anti intruder paint over a wide area you will most likely need multiple warning signs. Providing warning signage fulfils your duty of care toward anyone coming onto your property or into contact with your treated walls, poles, pipes and perimeter. Warning signs also act as a very effective deterrent. 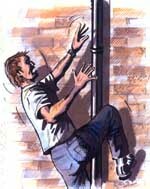 Would-be intruders are unlikely to scale a wall or drainpipe just to find out if there really is anti-climb paint in place. The thick, gloopy consistency of anti climbing paint means that it needs to be applied quite thickly in order to be effective. The recommended application thickness is around 2 to 3mm. Coverage requires around 2.5 litres of paint for each square metre that is to be painted. The paint can be applied by brush and we recommend using a disposable paint brush to save the need for cleaning afterwards. Appropriate precautions should be observed including the wearing of protective gloves, eye protection and ensuring adequate ventilation. A concern that is often raised regarding the use of slippery, non-drying security paint is how it might affect cats. 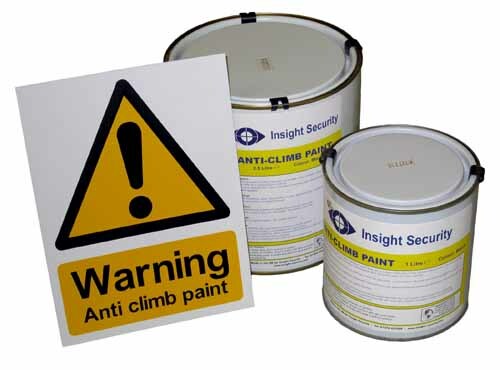 The anti climb paint that is manufactured for Insight Security contains no toxic or hazardous ingredients and will not cause any harm to cats or other animals. However, if they come into contact with the substance it will potentially adhere to their coats and paws. This can potentially result in the paint being carried by a cat into a property, marking floors and carpets. Please note: Anti-climb security paint could however be harmful to aquatic environments and it is therefore unsuitable for use around the garden pond or other aquatic areas. Anti climbing paint is based on a petroleum gel. It will potentially stain skin and clothing raising concerns regarding how best to remove it. Proprietary stain removers can help, but generally a solvent such as white spirit or turpentine, followed by a thorough wash, will remove paint stains from clothing. If you need to remove anti vandal paint from a surface to which it has been previously applied then a solvent such as white spirit, along with thorough washing, will work. 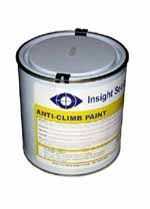 Anti climb paint health and safety data sheet. A practical guide to using anti climb paint. Buy anti climb security paint. Buy anti climb warning signs. What is anti climb paint?